Rescue that apple! Don't throw it away, but transform it into something scrumptious and satisfying. 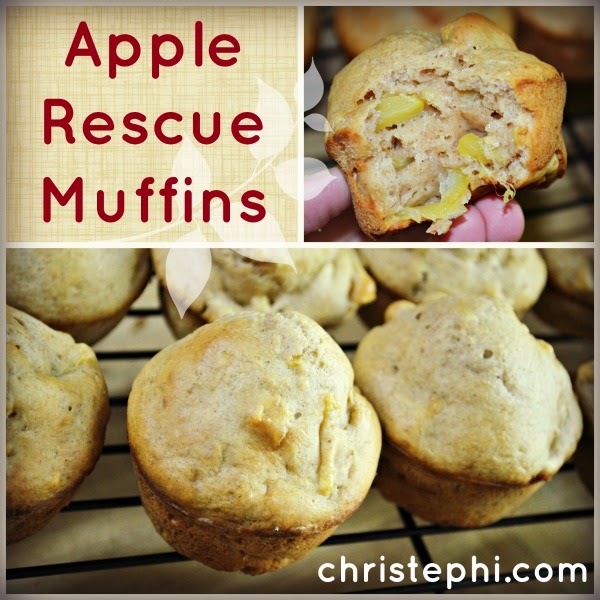 Once you rescue the apple and turn it into these delicious muffins, the muffins in turn might rescue you on a busy day as a quick grab-and-go breakfast or snack. Now doesn't that sound like a winner? Combine dry ingredients with wet until just combined. Do not over mix. Grease a muffin tin or use paper liners. Fill each cup nearly level. Bake for 20 minutes or until the largest muffin tests done with a toothpick. Cool completely before storing in an air-tight container. They also freeze well!